Neutrals are in.The classic serenity of neutral color palettes offer timeless elegance. The spectrum of warm neutrals ranges from linen and ivory tones to the richest sable and chocolate shades. Feeling bold? If you want to use a bright and bold color or pattern, use it as a primary focal point in your room. For example, choose a bold wallpaper pattern on just one wall or a brightly colored kitchen backsplash. Accent this main color with complementary colors on your window treatments and furniture. Get stuck in the middle. It’s okay to compromise with color. If you’re not quite ready for bold and bright, but you don’t want to go neutral either, consider “pseudo-neutrals” such as blue-gray or earthy olive tones. From silvery tints to deep smoky shades, gray is also a great way to add brightness to a room without going too bold. Textures are color, too. Well, maybe not exactly. 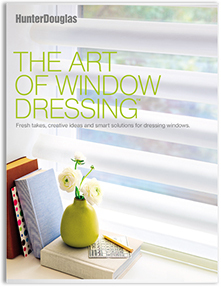 But natural woven wood patterns for window treatments, for example, add both color and texture to your windows. Other natural elements can also bring the calmness of nature to your rooms, such as textures replicating shells, sand, plants, and crystal. Draw inspiration from fabric. Custom made drapery, pillows, and window toppers can lead you to a primary color scheme or be focal points in and of themselves. 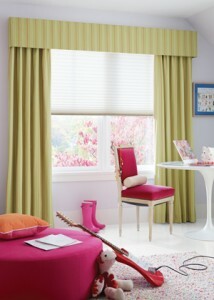 Striped drapes, checkerboard valances, or bright art panels can direct the eye to your room’s favorite features.